In every sector, there is a distinct and specific vernacular; a complex dialect of ‘internal speak’, jargon and acronyms which are used to communicate with the public. However, sometimes it is important to take a step back, to re-evaluate what organisations think they know, and ask the public what they understand things to mean. Unlike other words, heritage is not defined by simple guidelines, or indeed rules. The word ‘heritage’ is an umbrella term which can encompass different things for different people. To communicate effectively with the public about heritage, it is therefore important to understand what it means to them. On Wednesday 4th November, Katharine Peacock, ComRes Managing Director, presented exclusive research at the 7th Heritage Alliance debate to 180 professionals from the heritage sector looking at what the word ‘heritage’ means to the public. The findings show that the challenges faced in the sector are profoundly unique. Heritage, for many, is intangible; while images and icons such as Stonehenge and the National Trust act as signifiers for front of mind ‘heritage’ associations, the findings show that the associations run deeper. 1. Heritage is generally a positive term. 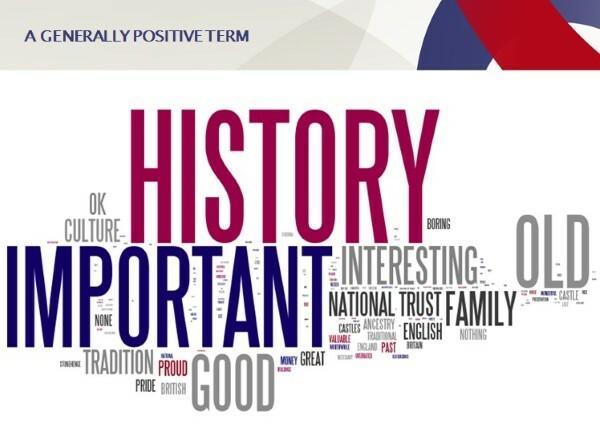 ‘History’, often used in conjunction with ‘family’, and ‘important’ are the words most commonly associated with heritage. ‘Boring’ is cited by comparatively few members of the public. ‘Good’, ‘old’ and ‘interesting’ are also popular associations with heritage. 2. However, it is critical to identity. On a cultural level, people associate heritage with physical sites and activities to learn about or visit; it encapsulates the ‘day out with the family’ that has something for everyone. However, on a more personal level, heritage is also associated with people, ancestry, and inheritance. While a subtler association with heritage, this is certainly one that the public often feel more strongly about. For many, it is a source of pride, and is seen as worth protecting for future generations. A majority of Britons believe the UK’s heritage needs protection and that the UK government has a moral obligation to do so. 4. Heritage is important to people, but not at the expense of the present. In conversation at the event, other speakers, Stephen Bayley and Liz Pearce CBE, noted that there is widespread appreciation that ‘death by preservation’ would be detrimental to society, so a balance between new developments and safeguarding heritage has to be reached. Compromise is essential, but more work can be done between both parties – developers don’t want to knock everything down and the heritage community understands that change is required for future growth success. Despite this, the research shows that most people say that heritage is not obstructive to future housing developments. 5. Heritage is important to the UK’s economy, but this is not front of mind. In addition, heritage is seen to be important, but is perceived to be a lesser priority than frontline government services such as the NHS. The research shows that the public do recognise that heritage has many benefits – to tourism, to the economy – but it is not top of mind. Heritage lags behind essential services such as the NHS, education or transport, and cannot be measured against the same metric. It is, however, seen to be intrinsically linked to other DCMS funded activities – arts and culture and sport. This research did not set out to re-name ‘heritage’; rather, to understand what people think of when they think of ‘heritage’, and what the aspects of it that resonate with them are. To understand the meaning of the word is the first step to communicating it effectively. Peeling back the layers of ‘heritage’ beyond the front of mind iconic brands and architecture will bring out the passion and pride felt by the industry among the wider public. Communicating about heritage with the public through the lens in which they see it – as a part of human identity, and part of what makes them proud of the UK – will set the sector on a path to successful engagement.